Heat oven to 450°F. Place bread slices on ungreased cookie sheet. Bake 4 to 5 minutes or until toasted. In 12-inch nonstick skillet, heat oil over medium-high heat. Cook peppers, salt and pepper in oil 5 minutes, stirring frequently, until peppers are tender. Set oven control to broil. 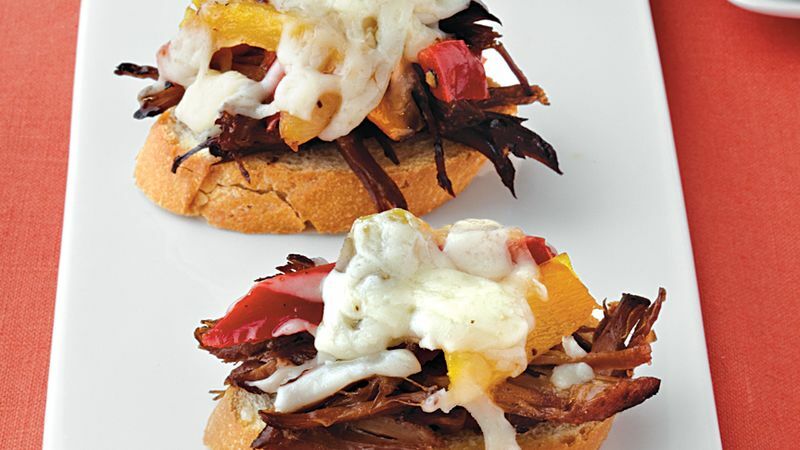 Top toasted bread slices evenly with shredded beef, pepper mixture and cheese. Broil with tops about 6 inches from heat 1 to 2 minutes or until cheese is melted and light golden brown. Use thinly sliced deli roast beef instead of beef roast, if desired.